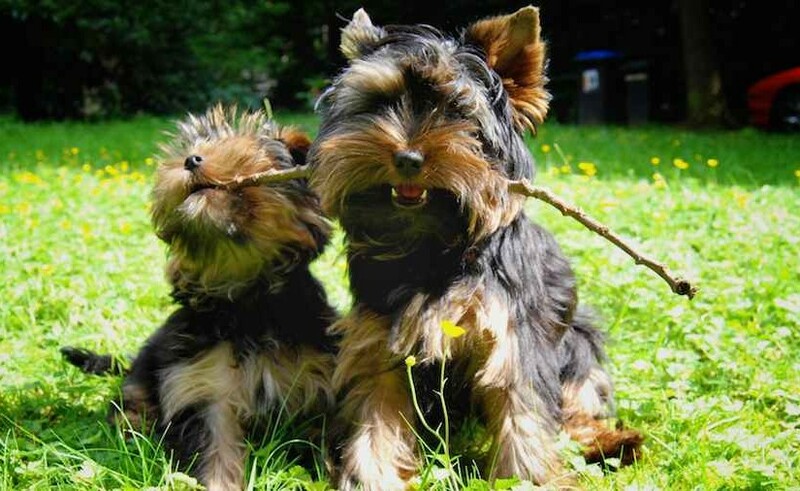 The Yorkshire Terrier is one of the most glamorous and popular of the toy dog breeds. It was originally bred in Yorkshire, England for the not so glamorous job of keeping down the rats in the coal pits and cotton mills. It was also used by the miners as a sporting terrier in rat-killing contests. If this seems a far cry from the dainty, profusely coated dog of today’s show ring, it should be remembered that this all took place in the mid-19th century, when the Yorkie was bred to do the work of a terrier and when it weighed in the area of 15 lb. (6.8 kg). The Yorkie made a big hit with the ladies and soon was in great demand as a pet. General Appearance: That of a well-balanced long-coated toy terrier, readily identified by its straight-flowing silky body coat of bright shiny lustrous steel blue and clear-shaded golden tan. The hair is parted on the muzzle and from the base of the skull to the end of the tail. The Yorkie is square and well proportioned. The dog’s high head carriage and alert expression give the appearance of self-confidence, a sparkling and vigorous manner. 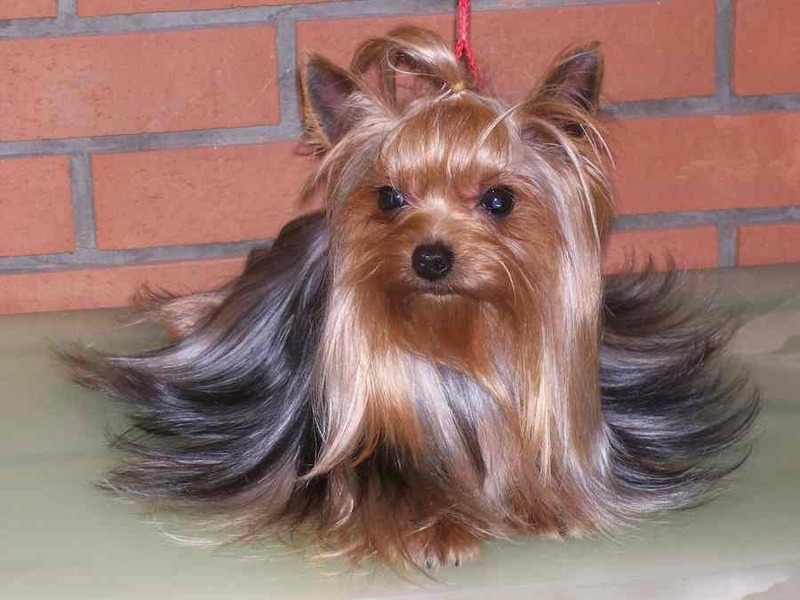 Yorkshire Terrier Temperament: The keenly alert air of the Yorkie is characteristic. He is intelligent, friendly, and willing to please. Size: The Yorkshire Terrier’s weight should not exceed 7 lb. (3 kg). Coat and Colour: Quality and texture of coat is of prime importance. The hair is glossy, silky, and fine in texture reflecting a certain brilliance and feels cool to the touch. 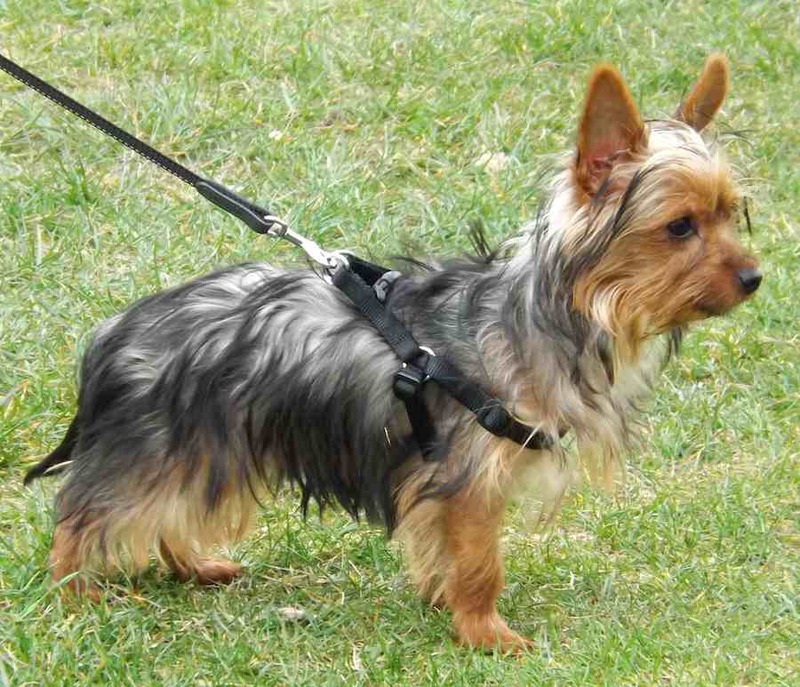 The coat on the body hangs perfectly straight, not wavy, showing the outline of the well-bodied Yorkshire Terrier. On the mature dog, the coat will eventually reach floor length. The fall on the head is long and tied in the centre with one bow. The hair on the muzzle is moderately long. Puppies are born black with tan markings showing a gradual progression to the colour of the mature adult dog to which the following colour requirements apply. Body Colour: The body coat is a bright steel blue, not light silver and not BLACK, not mingled with fawn, bronzy or black hairs. The blue extends over the body from the back of the neck to the root of the tail. Head, Chest and Legs: A clear golden tan deeper in colour at sides of head, at ear roots! and on the muzzle,with ears a deep golden tan. The golden tan hair is shaded from the roots down and does not extend down the back of the neck, nor above the elbows on forelegs or above the stifle on the hind legs. Yorkie’s Head: Skull should be rather small and flat, not too prominent or round. Muzzle not too long in proportion to skull, set on a 90 degree angle to the head forming the stop. Nose jet black. Mouth either level or scissor bite with strong sound teeth. Eyes oval, dark and sparkling, having a sharp, intelligent expression, placed so as to look directly forward. They should not be prominent and the eye rims should be dark in colour. Ears small V-shaped, carried erect, set high on the head, with the hair trimmed short on the tips. Neck: Medium length, blending smoothly into the shoulders to create the elegant head carriage. Forequarters: Legs quite straight, elbows neither in nor out, pasterns strong and straight with ideal shoulder angulation of 45 degrees. Feet are round with black toenails. Body: Topline must be level. The chest has a good spring of rib, oval in shape, with gradual rounding toward the base with sufficient depth for the elbows. The loin to be short and strong. Hindquarters: Sturdy, well-muscled hindquarters with proper angulation, sound stifles and hocks turning neither in nor out. Feet are round with black toenails. Tail: Dock to a medium length, with plenty of hair, darker blue in colour than the rest of the body, especially at the end of the tail, carried higher than the level of the back Undocked or natural tail must not detract from the overall appearance or balance. Plenty of hair, darker blue in colour than the rest of the body, especially at the end of the tail. Carried a little higher that level of back. Gait: Smooth and flowing, moving in a straight line, with a free and easy stride. Faults: Excessive shyness; cottony or woolly texture coat; black body coat on a mature dog; fawn or bronzy hair intermingled with blue; sooty or black hairs intermingled with the golden tan of adult dogs; overshot or undershot bite; rounded bat ears, cropped ears; roached back, sloping croup. Disqualifications: Ears held erect by tying the hair into the topknot. Any adulteration in the colour of the coat by artificial means. Q: Are yorkies hypoallergenic dogs ? A: Yes, Yorkies are hypoallergenic dogs. Yorkies produce less dander and don’t shed as much as other breeds, making them a good choice for allergy sufferers.